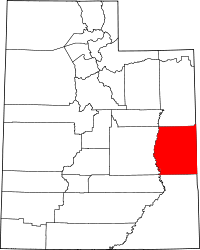 Grand County is a county located in the U.S. state of Utah. As of the 2010 census, the population was 9,225. Its county seat and largest city is Moab. The county was named for the Colorado River, which at the time of statehood was known as the Grand River. It is west from the Colorado state line. According to the U.S. Census Bureau, the county has a total area of 3,684 square miles (9,540 km2), of which 3,672 square miles (9,510 km2) is land and 12 square miles (31 km2) (0.3%) is water. The Green River forms the western boundary and Colorado lies on the eastern boundary. The Colorado River flows through the southeast corner. Deserts, cliffs and plateaus make up the scenery, with few settlements apart from the city of Moab, a Colorado River oasis. 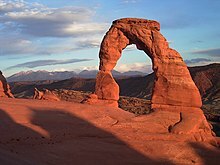 Arches National Park lies in the southern part of the county, just north of Moab. Also, the northernmost extension of Canyonlands National Park lies in the southwest corner of the county. As of the census of 2000, there were 8,485 people, 3,434 households, and 2,170 families residing in the county. The population density was 2 people per square mile (1/km²). There were 4,062 housing units at an average density of 1 per square mile (0/km²). The racial makeup of the county was 92.65% White, 0.25% Black or African American, 3.85% Native American, 0.22% Asian, 0.05% Pacific Islander, 1.66% from other races, and 1.32% from two or more races. 5.55% of the population were Hispanic or Latino of any race. There were 3,434 households out of which 29.80% had children under the age of 18 living with them. In addition, 48.60% were married couples living together, 10.70% had a female householder with no husband present, and 36.80% were non-families. 29.50% of all households were made up of individuals and 9.50% had someone living alone who was 65 years of age or older. The average household size was 2.44 and the average family size was 3.06. In the county, the population was spread out with 26.90% under the age of 18, 8.20% from 18 to 24, 27.90% from 25 to 44, 24.50% from 45 to 64, and 12.50% who were 65 years of age or older. The median age was 37 years. For every 100 females there were 96.30 males. For every 100 females age 18 and over, there were 95.10 males. ↑ 1.0 1.1 "State & County QuickFacts". United States Census Bureau. Retrieved December 29, 2013. ↑ "2010 Census Gazetteer Files". United States Census Bureau. August 22, 2012. Retrieved March 27, 2015. ↑ "U.S. Decennial Census". United States Census Bureau. Retrieved March 27, 2015. ↑ "Historical Census Browser". University of Virginia Library. Retrieved March 27, 2015. ↑ Forstall, Richard L., ed. (March 27, 1995). "Population of Counties by Decennial Census: 1900 to 1990". United States Census Bureau. Retrieved March 27, 2015. ↑ "Census 2000 PHC-T-4. Ranking Tables for Counties: 1990 and 2000" (PDF). United States Census Bureau. April 2, 2001. Retrieved March 27, 2015.